SUMMARY: It's 1995, and Anna has started seeing some strange things. Bennett, a boy she just met, seems to appear and disappear into thin air. One minute he is laughing and playful; the next minute he is pale and sick. He seems to know her, and then he doesn't seem to know her. What gives, Bennett? Nice-but-boring characters. The four major characters are all perfectly pleasant people who I might know or like in real life, but for a novel about something as exciting as time-travel, none of them seem interesting enough. "It's all about Anna." It feels that way, anyways. I do appreciate that Anna has a life of her own separate from Bennett. She has multiple friends, a passion for running, supportive parents, and a bright future, so I never really understood her obsession with travel and worry over "being stuck" in her small town. Really, girl? You are only in high school; most people haven't done lots of traveling in high school. Her hopelessness that she'll "never leave this town" is completely silly. Doesn't she realize that after high school, it's all up to her? She's a spring-semester senior graduating in a few weeks--what does she think happens after graduation? Methinks she doesn't have as much "fight" as her friend Emma gives her credit for. Drama. While Anna has plenty to keep herself busy, Bennett is a lot less involved in his own life and seems to live only for Anna. He's ready to leave his whole life, family, and decade behind for some chick he's barely known a month. Most teen boys in a new relationship would run the other way if their new girlfriend got all pouty and dramatic the way Anna does. She really rakes him over the coals at times, all because he didn't tell her "everything." Get over yourself, Anna. Sketchy details. I also questioned the premise behind Bennett's whole ability to time-travel. Seriously? He just decided one day to think about another place and time, and it worked? No other explanation? No time travelers in the family? No freak industrial accident? No ancient time-traveling rock? Nothing? Slow pacing. 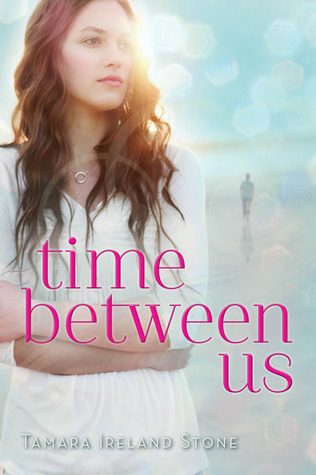 With only one real conflict, Time Between Us barely had enough substance to sustain an entire novel. I didn't really care if Anna and Bennett could make their romance work, and I thought the stuff with Emma (if you've read it, you know what I'm talking about) missed a huge opportunity for a cool secondary (or even primary) storyline. I was more interested in the fallout of the Emma/Justin storyline than I was in the romantic outcome of two nice-but-uninteresting people. How disappointing that the story didn't better explore Emma's change of fate or the repercussions of screwing around with time. I will say that I LOVED the abundant 90s music references, especially the lyrics to "If I Could" by Phish near the end of the story. I haven't thought about that song in forever, and I had to sing the lyrics over and over in my head to even remember it at all. Stone only includes the first few lines of the song, and it near about drove me crazy trying to remember the artist and title. Hoist was one of my favorite albums in college, and I had forgotten all about it. THE BOTTOM LINE: All in all, just okay. I've seen loads of positive reviews, so maybe it's just me. I don't think the book was bad, but I don't understand all the rave reviews, either. STATUS IN MY LIBRARY: It's not yet released, so we don't have it right now. I may still get it, especially if students request it or it becomes very popular. Sexuality: medium--some kissing, nondescript references to "spending the night"
I haven't heard of this one so, I appreciate your honest review. I will have to think about this one when it does closer to be being released. Thank you for sharing it.